Andrej Meszaros goes from Philadelphia to Boston. The Boston Bruins have obtained defenseman Andrej Meszaros from the Philadelphia Flyers for a 2014 third-round draft choice. 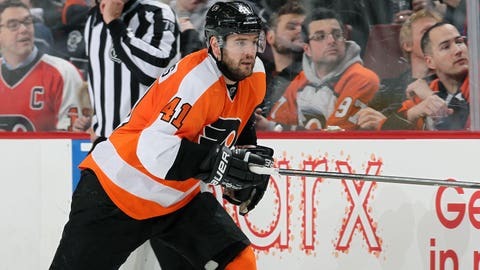 The 28-year-old Meszaros played 38 games this season for the Flyers with five goals and 12 assists. The nine-year veteran’s first two seasons with the Flyers were limited by a back injury in 2011-12, Achilles tendon surgery after that season and a shoulder injury in 2012-13. The Bruins also claimed 30-year-old defenseman Corey Potter off waivers from Edmonton. The six-year veteran has five assists in 16 games this season. Boston had been seeking a veteran defenseman after Dennis Seidenberg suffered a season-ending knee injury on Dec. 27 against Ottawa. They’ve also been without defenseman Adam McQuaid since he hurt his leg Jan. 19.